Each vial contains 5ml of aprotinin. We recommend using 0.6 TIU of Aprotinin (100 µl) per 1 ml of blood. This study was aimed to evaluate anti-inflammatory effect of the whole body cryostimulation in obese men. Fourteen subjects (BMI >30 kg m(-2)), divided into two subgroups according to cardiorespiratory fitness: higher (HCF) or lower (LCF), have been exposed to 10 sessions in a cryogenic chamber (-110 °C). Blood samples were collected before, 30 min and 24 h after the first, fifth and last cryostimulation. Coldness exposures affected blood cytokine profile; however, the response depended on subjects' fitness capacity. Concentrations of pro-inflammatory cytokines in the LCF decreased by 19, 6.8, and 7.4 % in IL-6, resistin, and visfatin, respectively. TNFα in the LCF dropped 4.3-fold compared to baseline, while in the HCF, changes were smaller, yet significant. Anti-inflammatory cytokine IL-10 increased in both groups. No changes in adiponectin and leptin were observed in either group. Obtained results suggest that whole body cryostimulation can be a supplementary method for obese in reducing systemic inflammation. Ziemann E, Olek RA, Grzywacz T, et al. J Physiol Sci. 2013;63(5):333-43. Aprotinin stability testing was conducted with Invitrogen Molecular Probes EnzChek® Protease Assay Kit E6639 over a period of 18 weeks. Aprotinin was stored at 4ºC between uses. The activity of trypsin, a protease used to cleave the BODIPY TR-X casein substrate (E6639), was compared to the activity of trypsin with aprotinin (0.6 TIU/ml), a protease inhibitor. Assay plates were read using a fluorescent plate reader with excitation wavelength of 589 nm and emission wavelength of 617 nm. Aprotinin inhibition of trypsin remains active during the 18 weeks and is relatively stable when the reagent is stored at 4ºC. Data collected over this period indicated the Relative Fluorescence Units (RFU) is inversely correlated to aprotinin activity and shows a slight increase (slightly decreased aprotinin activity) during the 18 weeks. Further testing over the coming months will reveal the stability of aprotinin. Graph 1. 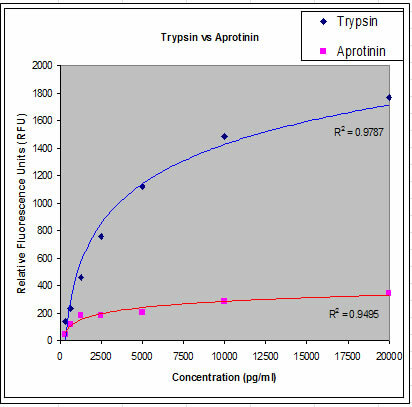 The stability of aprotinin was determined by comparing the activity of aprotinin (0.6 TIU/ml) inhibited trypsin to the proteolytic activity of trypsin (5 ng/ml) on the BODIPY TR-X casein substrate (Invitrogen Molecular Probes EnzChek® Protease Assay Kit E6639). Aprotinin inhibitory activities are inversely correlated to increases in Relative Fluorescence Units (RFU) and are directly proportional to increasing instability. Graph 2. The inhibitory action of aprotinin (0.6 TIU/ml) on various dilutions of trypsin was compared to the uninhibited proteolytic activity of trypsin on the BODIPY TR-X casein substrate (Invitrogen Molecular Probes EnzChek® Protease Assay Kit E6639). 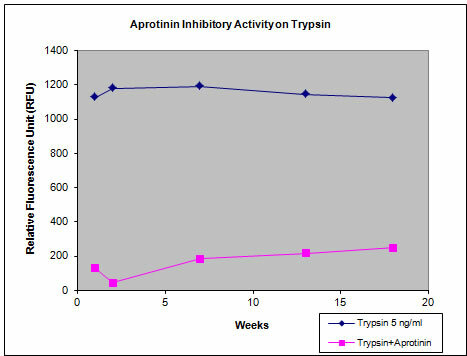 Aprotinin was able to successfully inhibit trypsin at all concentrations, from 20 ng/ml to 312.5 pg/ml, after 18 weeks of storage at 4ºC. Testosterone is a strong correlate of ghrelin levels in men and postmenopausal women. Greenman Y, Rouach V, Limor R, Gilad S, Stern N. Neuroendocrinology. 2009;89(1):79-85. Effect of the glycemic index of carbohydrates on day-long (10 h) profiles of plasma glucose, insulin, cholecystokinin and ghrelin. Reynolds RC, Stockmann KS, Atkinson FS, Denyer GS, Brand-miller JC. Eur J Clin Nutr. 2009;63(7):872-8. Circulating preprandial ghrelin to obestatin ratio is increased in human obesity. Guo ZF, Zheng X, Qin YW, Hu JQ, Chen SP, Zhang Z. J Clin Endocrinol Metab. 2007;92(5):1875-80. C-type natriuretic peptide in individuals with normal left ventricular systolic function. Kuo JY, Yeh HI, Chang SH, et al. Scand Cardiovasc J. 2007;41(3):155-9.